Flirty ruffles made eye-catching appearances at Autumn-Winter 2009 fashion shows including those of Moschino and Louis Vuitton. Add these girly frills to your casual wardrobe by throwing a ruffled cardigan over your basic tank and jeans. These feminine details don't always have to make up a sweet outfit. Get seriously stylish for work in a white ruffled button-down paired with a black high-waisted skirt and a cardigan, or a pair of slacks and a cropped blazer. Nothing beats the LBD in surviving trends season after season. 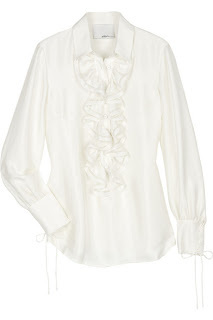 Small ruffle details update this sassy staple. Looks like the recession's having designers resurrecting familiar trends. Just rummage through your closet for old frilly favorites or add a ruffly piece or two to revamp your everyday wardrobe! Help the Victims of "Ondoy"
This Tee is So Me!